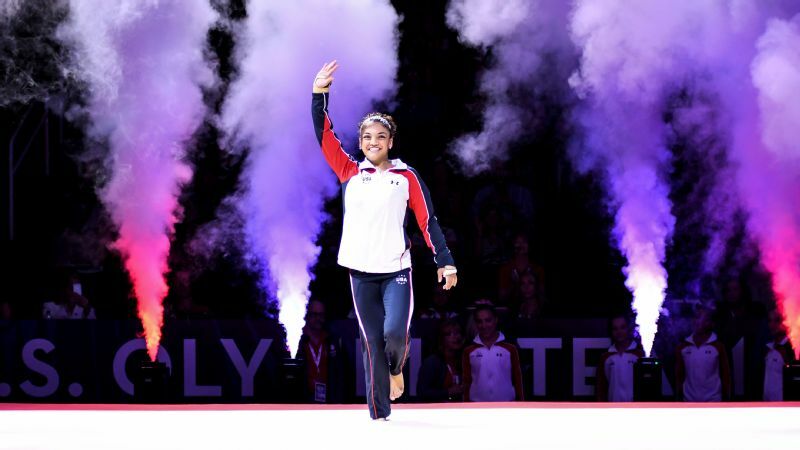 Laurie Hernandez placed second in the all-around after two nights of competition at the Olympic trials, and first on beam. "I was really calm before beam," Hernandez said. "I was able to calm myself down and go out there and enjoy the moment." It's a technique Hernandez learned from sports psychology coach Robert Andrews, who heads Houston's Institute of Sports Performance and also works with three-time world champion Simone Biles. Watch Hernandez closely before she presents to the judges at each rotation and there she is: hand over belly, gaze softened yet focused, her shoulders rising and falling with each inhalation. Laurie Hernandez's pre-routine ritual includes this breathing exercise that calms her right before she goes. "And I pray," she said. Her pre-performance ritual is working. Over two days of competition, Hernandez -- the freshest face on this powerhouse team -- was a rock. She was as consistent as any woman in the competition, her confidence and composure decades beyond her 16 years. As Hernandez moved from rotation to rotation, she energized the crowd like a portable charging station. Her floor routine is so electric it should be measured in wattage. "When we choreographed her routine, we tried to focus on her personality and let her be herself," said Maggie Haney, Hernandez's longtime coach at MG Elite in Morganville, New Jersey. Besides being a showcase for Hernandez's outsized personality and dance ability, her floor routine, which she debuted at national championships in June, also pays homage to her 10-year career in gymnastics. "You can see dance choreography from her floor routines when she was 9, 10, 11, all through the years," Haney said. "But with added sass, because she is naturally so sassy." That sass is what has made Hernandez, the first Latina gymnast since Annia Hatch in 2004 to represent the U.S. in women's gymnastics, a thunder-stealing crowd favorite. But it is her maturity and consistency that landed her in second place overall and a spot on the U.S. team. When she stuck her double pike dismount after performing what she called the best beam routine of her life, the crowd broke into the same raucous, foot-stomping singsong it had earlier in the night, when Hernandez prepared to perform on floor. The chorus grew only louder when Hernandez's score of 15.70, the best of the weekend on beam, flashed overhead. "After beam, I couldn't hear anything," Hernandez said. "I was still in focus. I can't hear anything when I'm focused. But before floor, I heard them chanting my name." Six months ago, casual gymnastics fans didn't know the her name. By Sunday, Laurie Hernandez was a star. From the outside, Hernandez's rise seems meteoric, an overnight sensation amid a boldfaced team of Olympic and world champions. But to those close to her, this moment has been inevitable. "She has been in our program for so long. 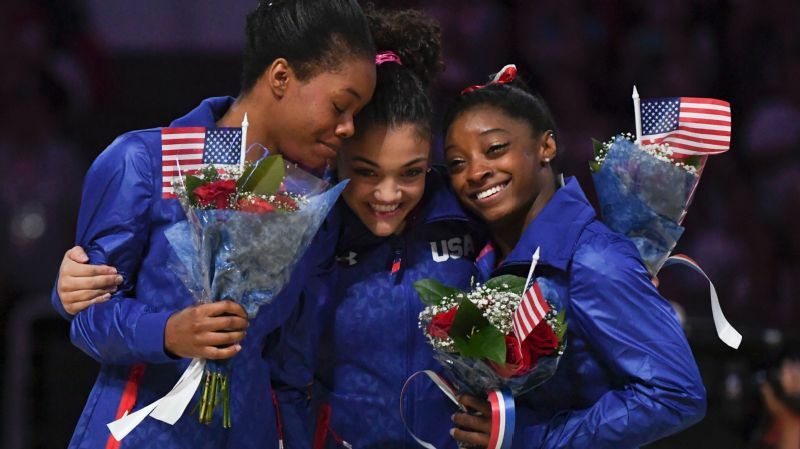 She grew up in our system," said U.S. national team coordinator Martha Karolyi, who remembers first seeing Hernandez at a national developmental camp when Hernandez was about 9. "It's not like she just popped up here." Hernandez began appearing on Olympic watch lists last year after winning the 2015 junior national championship. She turned senior at the beginning of 2016 and celebrated her 16th birthday on June 9, but her relative lack of elite international experience makes what she has done over the past six months even more incredible. From March until June, she took a trio of bronze medals in the all-around at the City of Jesolo Trophy in Italy, Pac Rim Championships and the national championships. 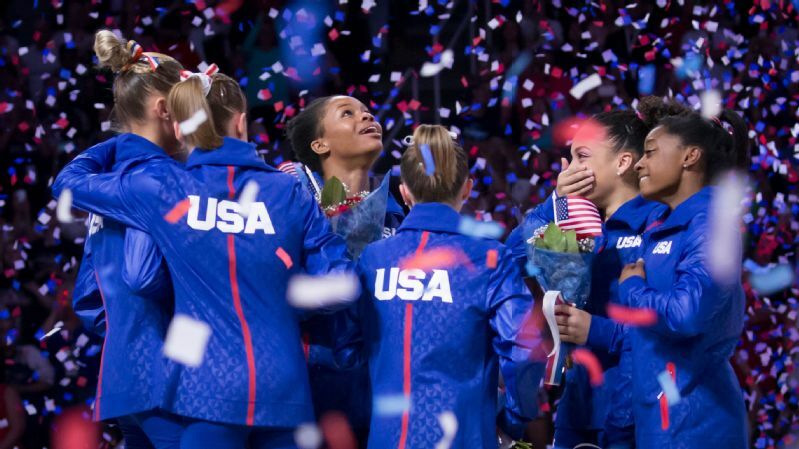 "She proved herself over these two days and throughout the year," Karolyi said. "She had no falls in any competitions that she presented this year. She had very good consistency." 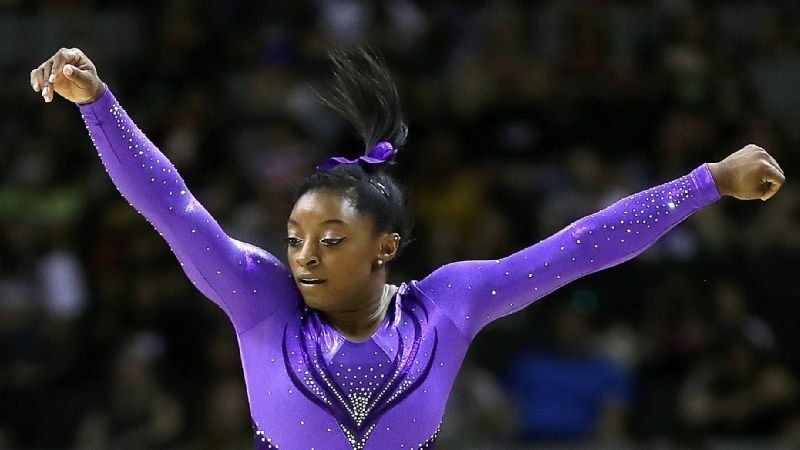 In San Jose, Hernandez was the top finisher both nights on beam, an apparatus that took down both Gabby Douglas and Biles during two nights of competition, and finished third on floor, fourth on vault and second in the all-around. In the Olympics three-up, no-drop team competition format, Hernandez could compete as many as three events and has a legitimate shot at being one of only two U.S. women who will contest the individual all-around. "That's what we want," said Haney, "That would be the best thing ever." A few months ago, Hernandez wasn't even part of that conversation. Today, crowds are chanting her name.